Hi! I'm 22 years old, I'm a master student in electrical engineering. Although passionate about languages and writing, I speak fluently French, English and Arabic. I...Read moreHi! I'm 22 years old, I'm a master student in electrical engineering. 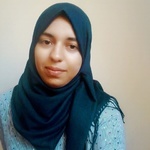 Although passionate about languages and writing, I speak fluently French, English and Arabic. I can do translations of texts, articles, books, announcements, reports, News (technology, fashion, lifestyle, coaching, science, .....) between French, English, and Arabic. 3- MS Excel or Spreadsheet. 4- Any Type of Data Entry Projects. 6- Data Scraping and Web Scraping. 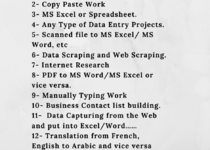 8- PDF to MS Word/MS Excel or vice versa. 10- Business Contact list building.